Why Not Just Let the Dog Out? As suggested on my About Wild Trumpet Vine page, I often write about walking my dog. Those who can’t imagine why anyone would choose to write about dog walking are unlikely to be regular readers. There may be some of you who wonder why my dog has to be walked multiple times a day in every kind of nasty weather. Why not just let him out, occasionally, in the fenced back yard? Doesn’t he have the good sense to relieve himself, perhaps, as we had hoped, in the woodsy, secluded area behind the garage? These are good questions. The answer to the first is complicated; the answer to the second is simple: NO. 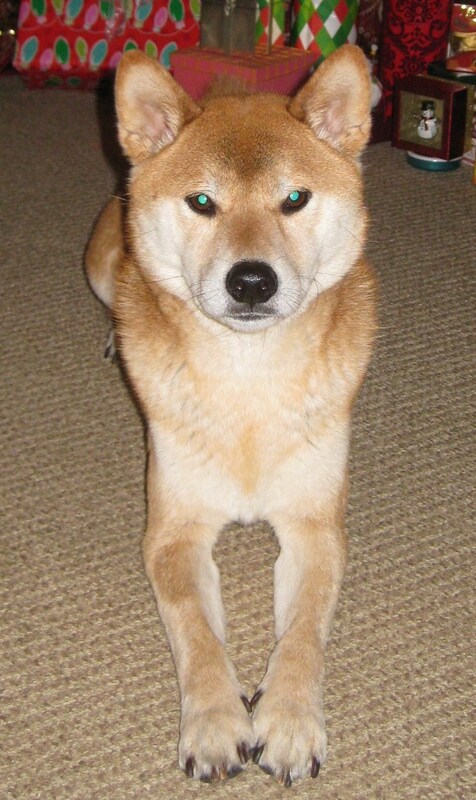 Kiko, true to his Shiba Inu nature, is emphatically clean and fastidious. This sounded like an excellent trait when we were considering our future family dog. And in many ways, it is a good trait. Our yard is never messy, and our carpets are holding up well. But obsessive cleanliness has its dark side. Kiko refuses to sully not only his home, but also the broad vicinity of home. Several years ago we tried cutting down on the walks. After Kiko had injured his back leg in a reckless jump from our unfinished back porch (see A Puppy Days Delayed Replay, Nov. 2011), the vet advised keeping walks to a minimum. At the time, I was recovering from surgery, and the prospect of fewer winter dog walks was appealing. Ever since he was a puppy, Kiko has indicated his desire to go out by staring fixedly at me, then pawing at the door. Instead of gathering my cold-weather gear and the leash, as I had typically done before, I began opening the door that leads to our porch and enclosed back yard. Kiko would rush through his doggie door with a great sense of urgency and purpose, make a speedy circuit of the yard, return immediately and begin pawing impatiently to come inside. This would be followed by another staring episode, another interior pawing at the door, another fast trip around the yard. We repeated the process so many times that I felt as though I was losing my mind. Kiko seemed to feel the same way. I could see his frustration: Why can’t we walk? I’ve got to get out of this stupid yard! This is my hunting and lounging area, not my potty place, for heaven’s sake! The Kiko Stare: Take me Out, Now!!! I tried walking him on the leash in the back yard, but that only compounded the misery, adding mine to his. I invited neighborhood dogs over to visit, hoping they would mark and inspire Kiko. He remained uninspired and steadfast. His obstinacy is matched by the strength of his bladder; our dog is nothing if not continent. Kiko gave in a very few times, but only in the middle of the night and in hopeless, broken, pitiful desperation. The next day the routine would begin again. No break-through came, and the situation was intolerable. It wasn’t doing anything to further my recovery or my dog’s. We went back to walking, much to Kiko’s relief, as well as mine. I brought new resolves of patience to the task. I’ve mentioned that despite the miles we cover together, Kiko’s on-leash behavior is generally less than stellar (see The Joys and Travails of Walking our Strange Little Dog, Oct. 2011). But I find it hard to blame him. My extremely social dog is under the thrall of his acute sense of smell. His nose serves as smartphone, Internet, Facebook, Twitter and Instagram, all rolled into one neat package that he cannot set aside. Kiko smells great troves of valuable information about his friends—Buster turned left at this corner, Annie says hi, Shyla wonders where he’s been, Lucy is tolerating the new foster puppies, and sweet three-legged Raven is having a good day. I hate to block my dog’s vast friendship network by dictating exactly where he can and cannot go. Kiko’s nose often leads him to his buddy Lucy, who is similarly fastidious. 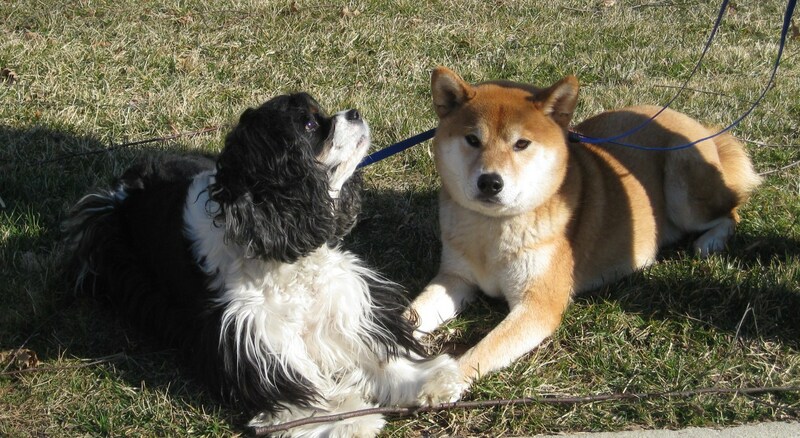 A well-matched pair of old friends, they seem to be holding paws. After the painful, failed trial period of not walking, it seemed that Kiko’s behavior improved somewhat, or perhaps I simply chose to believe that it did. I had missed walking my odd little dog even as I tried to avoid it. 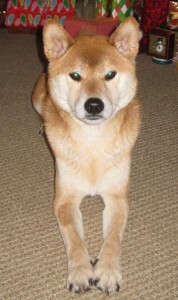 Now, it’s a given that on the most frigid of mornings, I will be out with Kiko. I walk with him because I consider it my duty. It’s in our contract now. I stay out far longer than necessary because I enjoy it, despite the weather. It wasn’t Kiko’s fault that the tendrils of hair at the side of my face froze one day last week when it was 15 degrees. I had been breathing into my scarf, and the condensation turned to ice. 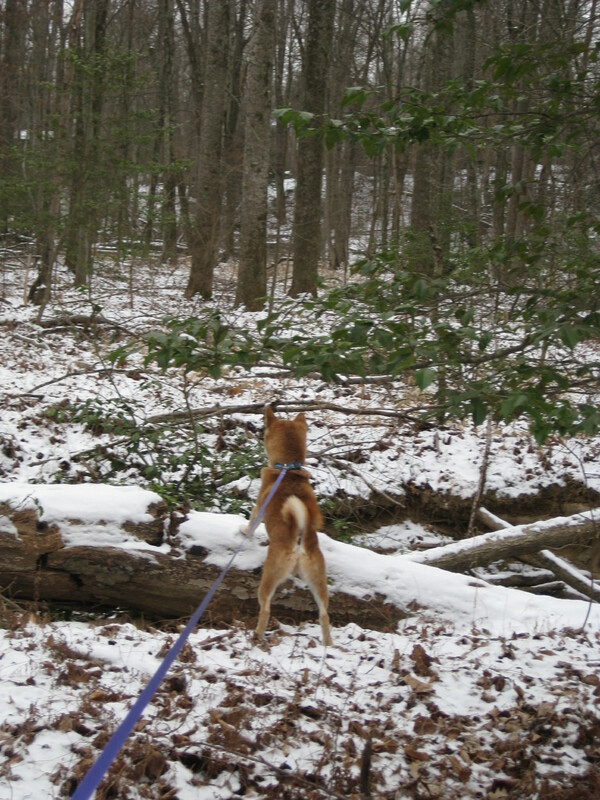 We didn’t need to wander for an hour and a half (although cold days are Kiko’s preference). 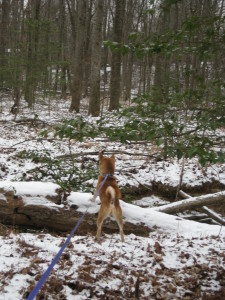 But I was well-bundled, and once we were out, in the still-snowy, beautifully frozen woods, spotting Kiko’s double, the red fox, the watchful pair of hawks, the pileated woodpecker and the white deer that roams our area, I didn’t want to hurry home.